Calphalon vs All Clad Cookware comparison guide. Among some of the best selling cookwares that you can find in the industry today are Calphalon and All Clad which are arguably among the best when it comes down to performance and quality. In this Calphalon vs All clad comparison, we will dig deep onto the two brands and help you decide which one you should put your money on. What Should You Look For in Cookware? If you are old enough, then you probably remember your mother or your grandmother having just one set of pans throughout their entire life, but in today’s world, that is pretty rare. Although we now have non-stick cookware, the truth is that many of these brands are made from inferior materials that don’t last. When you combine that with the fact that we tend to put our pots and pans in the dishwasher and use metal utensils on the non-stick surfaces, then you should expect to go through numerous sets of pots and pans during your lifetime. Obviously, everyone has their own particular preferences when it comes to the size and shape of the pots and pans that they like, the type of coating that they have, and of course how they look on the outside. Calphalon cookware sets come in a wide array of materials, from stainless steel and aluminum, to hard-anodized aluminum, ceramic, cast iron, and copper. Some of these sets come with matching tops in the same materials or you can buy glass tops so you can see your food as it is cooking. The choice is really up to you. The quality of a cookware has as much to do with how well you can cook with it as it does with how long it will physically last. A high quality set like Calphalon is designed to help you cook easier, quicker, and without the uneven heating that you often find in inferior products. If you make a lot of sauces, then this is imperative, since you will be able to heat up your sauce quickly to a high temperature without worrying about one section of the pot or pan getting hotter than the rest. Even heat is essential to the best cooking. Another thing to keep in mind is how well a pan will clean up. Most Calphalon and All Clad models are capable of being washed in a dishwasher without losing any of their non-stick appeal. Of course, if you want to get the most out of any cookware, you should wash it by hand, but it is still good to know that you can put it in the dishwasher if you want. This is a brand of pans that has been around for many years, with the company itself now being owned by Rubbermaid. This is one of the most popular brands of cookware in the United States, and is found on more bridal registries than any other brand. Calphalon Cookware is as popular in commercial kitchens as it is in family kitchens, primarily because the entire line of cookware is so well made. Pretty much everyone who does a lot of cooking has their own favorite pan in their kitchen to cook with. This pan is the one that is used for making morning eggs or sauces for dinner, and it is the one pan that seems to hold up better than all the others. Chances are that if you look at the bottom of that pan, you will see the Calphalon Cookware name, because this is not only one of the most popular brands of cookware, but it is usually a cook’s favorite, too. It doesn’t take you long in a kitchen to soon realize that not all pots and pans are the same. In the past few decades, there has been a trend toward non-stick surfaces, which obviously makes a lot of sense, but what people didn’t initially realize is that once that non-stick surface is compromised – often through the use of metal utensils or simple dishwashing – toxic materials can begin to get into your food. It is also not unusual for non-stick surfaces to lose that non-stick ability and to actually become harder to clean than traditional cookware. The reason why Calphalon Cookware is so highly prized by cooks who really know what they like is because they are made from a hard anodized exterior that ensures that the pots and pans will not chip or crack. This material is then coated in two layers with non-stick materials, so that they will maintain their integrity for many years. In fact, all Calphalon Cookware is backed by a full ten year warranty, and they are even oven safe at up to 400 degrees. With other brands, there aren’t often a lot of choices in terms of various price points, but with Calphalon Cookware, you can choose from different prices to start building your set. You can buy individual pieces or one of the larger sets, and keep building your collection as you see fit. In terms of materials, Calphalon comes in the following stainless steel, aluminum, hard-anodized aluminum, ceramic, copper, and cast iron, all of which have their own purposes. Many of these pieces also come in different colors, such as black, silver, grey, red, blue, tan, white, brushed aluminum, and of course copper. The Calphalon Contemporary Series has a stainless steel and a nonstick anodized versions. The Simply Calphalon also come in stainless steel and nonstick and enamel. The Calphalon Commercial series is the hard-anodized selection and is not available in nonstick. To begin, a cookware set provide you immediately with a range of pots and pans to meet your kitchen needs. There are various sized sets available, each of which is thoughtfully put together. You can select the set that best suits your cooking habits and style and immediately have a kitchen stocked with professional-level cookware. 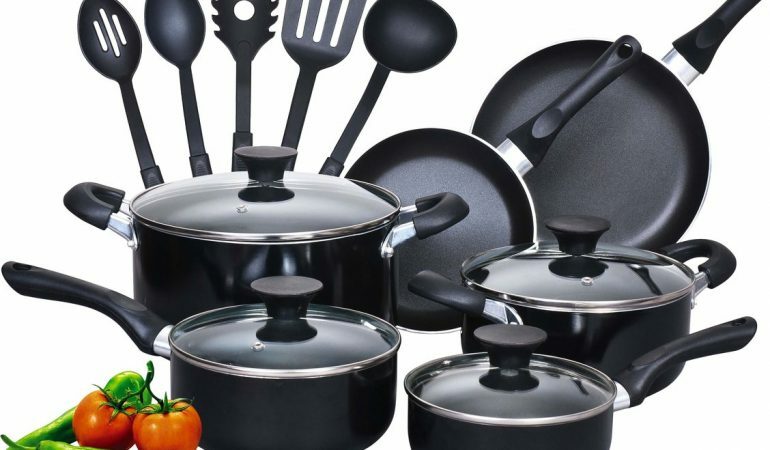 Also, a cookware set acts as excellent foundation for your cookware collection. Even though you be able to do just about anything with most All Clad sets, as you gain more experience in your kitchen repertoire expands you’ll probably find yourself wishing for a slightly larger saucepan, or perhaps a sauté pan in addition to a skillet. With this practical experience in the kitchen, you can then confidently expand your collection of All Clad knowing that the next piece you buy will be well used. Another reason to buy an All Clad set is financial. Let’s face it: completely stocking a kitchen with such high quality cookware is a significant investment for most of us. We may be able to afford it, but it is not pocket change either (if it is “pocket change” do you, well, more power to you). As I mentioned on another page, if you spend a significant amount of time cooking spending the money is well worth it. All Clad cookware will easily last a lifetime so the cost per use comes down to pennies. More important than that however is the pleasure you’ll feel using quality tools and the enjoyment you’ll get from the superior results they produce. Why choose All Clad Cookware? All Clad cookware is widely recognized as one of the premium, if not the premium, brands of cookware available. What makes all clad cookware so special? The concept behind All Clad is that various metals are combined to take advantage of the performance properties of each. The goal is to create cookware that performs better than cookware made of a single metal. For example, aluminum and copper both conduct heat very well and distribute it evenly, but both also are soft and react with food. On the other hand, stainless steel is very durable and non-reactive, but does not distribute heat as evenly. By bonding stainless steel to copper or aluminum, a manufacturer can create cookware that has the durability of stainless steel and the heat distribution and retaining characteristics of aluminum or copper. Of course, all this is easier said than done. Is difficult to get two different metals to bond together seamlessly, especially when they’ll be exposed to high heat of a restaurant quality still. The founder of all clad, Jon Ulam, was a metallurgist so using highest-quality alloys and the most sophisticated bonding techniques has always been the foundation of All Clad’s quality. But the quality of the materials is only the beginning. Design consideration and attention to details are also crucial to the final result. All clad pots and pans are known for their balance, the comfort and strength of their handles and the small details that experienced chefs truly appreciate. Beyond this, All Clad cookware is extremely durable. You can realistically expect it to last a lifetime and beyond. Is All Clad Cookware Worth the Expense? Let’s face it: All Clad Cookware is expensive. By and large, this is one of those situations where you do need to pay more for higher quality. However, very few of us have unlimited budgets. It’s appropriate for us to ask if paying a premium price really translates into improved value and performance. Is it worth it for us? In short, do you get good value when you make an All Clad purchase? Your All Clad pans will never wear out easily. It could end up being the last set of cookware you need to buy. Although the initial purchase price may seem high, if you think about it in terms of cost per use its actually quite low. And of course you can’t really put a dollar and cents value on the pleasure you’ll derive from working with top quality cookware and the improvement it will make in your cooking. Calphalon vs all clad – Which is better? At the end of the day, it all comes down to picking the cookware champ; one that is of better quality, performance, durability and overall value. If you are like most people who do the majority of the cooking in your household, you probably find yourself suffering through a set of cookware that has been made up out of various sets, with certain pieces that have survived throughout the years. Some of your pieces might be hand-me-downs from your mother, while others might be cheap pots and pans that seemed like a good idea at the time. But, if you want to get more enjoyment out of cooking and actually do a better job while you are at it, then Calphalon cookware sets are a great investment. After comparing Calphalon vs All Clad, we can say that Calphalon is much better in terms of durability, performance and quality.